The tally of the decade (or so it seems): NAC: 893, Louvain: 2. As the neglected stepchild of US seminaries abroad prepares to mark its sesquicentenary, its representation in recent episcopal appointments doubled in the last 24 hours with the appointment of Fr Shelton Fabre of Baton Rouge as auxiliary bishop of New Orelans. Bishop-elect Fabre was named to succeed Bishop Dominic Carmon SVD, whose resignation was accepted on his 76th birthday. An effusively respected and admired pastor in his home diocese, just past his 43rd birthday Fabre ends Auxiliary Bishop of Detroit Daniel Flores' six-week reign as the American hierarchy's youngest member. 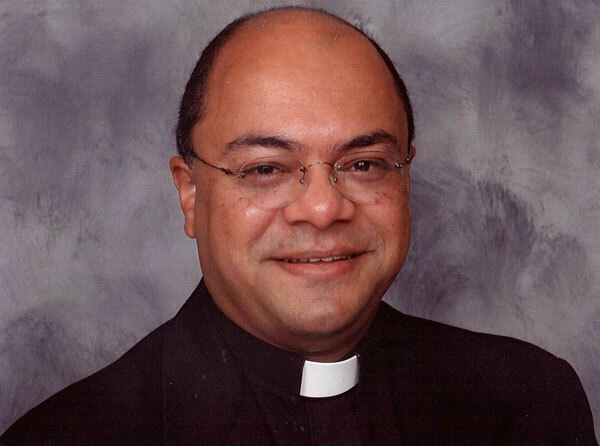 Ordained in 1989, he's served in parish ministry throughout his priesthood, even while spending the last decade also balancing duties as Baton Rouge's defender of the bond and, from 1994-2001, director of the diocesan office for African-American Catholics. Those seven years ('94-'01) figure into this appointment, and not solely for purposes of the CV -- the bishop of Baton Rouge during that time was Alfred Hughes, the current archbishop of New Orleans, who will ordain Fabre to the episcopacy on 28 February in the Cresent City's Cathedral-Basilica of St Louis. In case anyone's having difficulty following: 2 + 2 doesn't equal 2. So, you're asking yourself, what's it all about? 1. Sign of Roman favor for Alfie? Sure. 2. In these days of a US appointment operation which, by force of circumstance, has become triage (whatwith other auxiliary requests filed two years ago collecting dust and Lake Charles, among others, still waiting), sign of Roman solicitude for Mother New Orleans post-Katrina? Even more so. And can we yet see a pattern emerging from the last year? Mhmm. Buzzwords to keep in mind: From the middle. From the heart. Quiet, effective holiness. Workhorses. Pastors with savvy. Respected, adored, beloved across the board. Smart. Gifted. But not inaccessible nor hung-up. Youth = not the liability it was not all that long ago.... Ecc. ecc. ecc. Don't be fooled, people -- it's a whole new ballgame. And the newest nominee culled from that schema told today's Times-Picayune that "My first reaction was that I lost my stomach and I'm still looking for it." The honesty of the statement is backed up by the folks in the capital; among the priests of Baton Rouge, Fabre is said to have the reputation of a "tremendous pastor" with a "relaxed" style, possessed of "no ambition whatsoever" beyond serving in the capacity desired of him. Once he arrives in New Orleans, it's also been announced that the new bishop will take on the pastorship of a parish in addition to his archdiocesan duties.